Suffering from an accident-related neck or back injury? We can help. Our Santa Cruz personal injury law firm is experienced and successful in back injury-related legal cases. Back injuries can be sustained in many types of accidents, the most common of which are motor vehicle accidents. Car accidents account for more than one million back injuries each year. Ten percent of these car accident back injuries lead to long term disability. 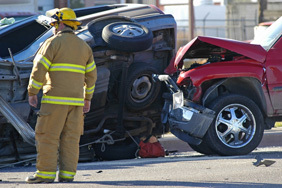 The type of car accident back injury which occurs most often is rear end collisions. Other common motor vehicle accidents that cause back injuries involve a vehicle striking a non-moving object or getting broad-sided by another vehicle. Neck and low back injuries occur when a victim’s body is violently thrown forward and then backwards during a collision. Musculoskeletal injuries that often occur in automobile collisions include injury to the joints, disks, muscles, nerves, and ligaments of the neck and lower back. Car accident back injuries can often be difficult to diagnose, or may be misdiagnosed if there is an underlying disk injury that has not been identified. Some symptoms are indicative that a disk in the back has been injured. If a disk in the neck has been injured, people will often experience a numbness, tingling or burning sensation down either one or both of their arms. If a disk in the lower back has been torn or herniated, a victim will suffer a tingling, numbness or a burning sensation down one or both of their legs. Back injuries due to accidents also include spinal cord injuries. A spinal cord injury can be caused by different types of trauma including bruising (contusion), or excessive pressure (compression). Spinal cord injuries to the back can cause serious nerve damage resulting in paralysis, loss of feeling, loss of reflex function, and atrophy. Spinal cord injuries due to car accidents, a fall, or any other type of trauma can lead to secondary medical problems including infection, muscle spasms, and loss of bladder control. There are a number of medical tests that can be performed on a patient who is thought to have sustained a back injury. In some cases, back injuries can be detected through the use of x-rays, though muscle strains and sprains cannot be diagnosed through this medical test. Medical doctors often use CT scans, MRIs, myelograms, or discograms to determine the nature and extent of a back injury suffered due to a traumatic event.